All Ingen Database Entries (I Read Your Book Achievement). Decided to make a guide for how to keep raptors in their enclosure most of the time. They will get out from time to time, but not that frequently. 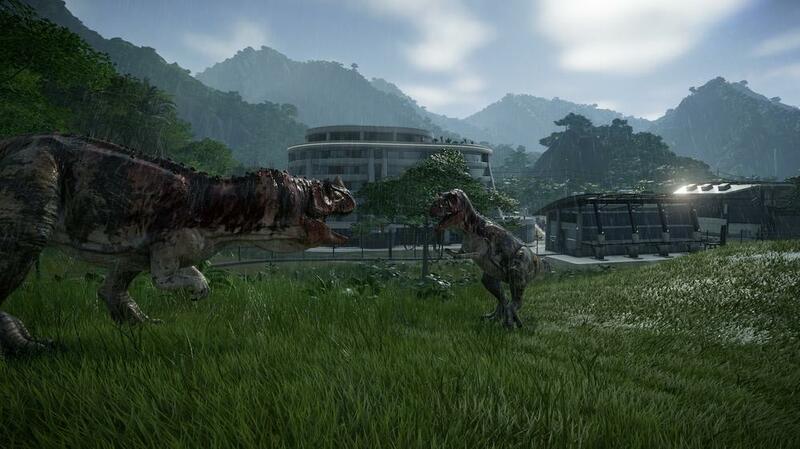 The very first thing is to realize that raptors have a very short fuse compared to the other dinos in the game. They will go into the red rather quickly if something upsets them. That means you got to do your best to keep them really comfortable during normal conditions. Another thing that is important to note is they will escape. The only thing you can do is decrease the number of times and increase the time inbetween escapes. 4 no more and no less in an enclosure. You can have more in the park. 2 is not enough to meet their social needs. 3 can work. In my experince not as well as 4. Only having 3 will result in their comfort level dropping slightly from time to time because a slight lack of social interaction. Add something else making them uncomfortable and you get an unhappy raptor. Plus if one dies you need to rush to replace it. You will not have a whole lot of time before the 2 left will be tearing at your fences. 5 or a couple more than that works. That is also more than 4 raptors trying to break down your fence. Which increases the chances of them breaking through your fence. It is also more raptors you need to chase down when they eventually breakout. 4 is the number. No more. No less. 4 is the number thy shalt have and the number thou shall have is 4. 5 thou shall not have. Neither shall thou have 2 except when proceeding to incubate 3 and 4. 6 is right out. Once thou reach 4 being the 4th raptor to be incubated thou shall stop incubating them. A single light electric fence. No need for mutliple and/or heavier fences. My guess if you are reading this it i very likely you tried it and it did not work. I will contradict myself a little later on this. A smallish enclosure. I build mine a little further out then the sight lines for a viewing platform. Trees far enough away from the fence that you have a good view of both sides of the fence. You do not want any difficulty seeing what the raptors are up to when they are near the fence. Water of course. One click with the size set to small somewhat in the center. Before placing in your raptors cover about a 1/4 of the enclosure with trees. When you place your raptors you will adjust it from there. Encubate 2 raptors or if you are set up to do it 4 at the same time. Only release one and move it to the enclosure. Click on it and press "R". When the window opens select the 2nd tab. This is the information about what the raptor likes and does not like about the enclosure. Take note of it. You want the indicators to not be in the red and more than 1/2 way towards the right. For most other dinos you can get away with just not being in the red. I do not suggest that for the raptors. You want them happy under normal conditions anywhere in their enclosure. If the grasslands is too low and the trees to high just remove trees and vice versa. You should very quickly find a sweet spot where the raptors comfort level for forest and grassland is about the same and more than 1/2 to the right. The covering about a 1/4 of the enclosure with tress before putting in the first raptor will get you close. Place 2 live feeders on opposite sides of the enclosure. Place the pile of meat version of the feeder towards the center front of the viewing platform. This most of the time is more feeders than you need. Occassionally dependng when each raptor decides to eat one will be left out and start getting upset with just 1 or 2 feeders. Having the pile of meat version helps ensure everyone eats and gets full. The 2 live feeders are selected to keep the Raptors somewhat happy because they get to hunt a kill a goat. Electric inside. Light or heavier fence outside. This can work at times, but only if you are keeping your raptors comfortable enough to begin with. May prevent an escape during storms. It works pretty well if your raptors are happy when the storm starts. Storms will make your raptors uncomfortable and not too long after a storm starts your raptors will start testing your electric fence. If power remains on and the strom is not too long the electric fence should hold them. If not the other might if the strom ends shortly after the raptors broke through the electric fence. When the storm ends and everything is set up right for your raptors they should calm down enough that they stop trying to breakout. I have had mixed results and after some testing and playing around with it I am not really sure if the second fence is that helpful. If they make it through the electric fence the non-electric one is generally not enough to stop them unless the strom ends almost at the same time the electric fence was breached. I have nit tried 2 eletric fences yet. Since most times the raptors make it through the eletric fence in my games is when there was a power failure. Have a ranger station somewhat near your raptor enclosure. So your rangers can get there shortly after the raptors tart damging the fence. Upgrade the ACU. I recommend all but one of the upgrade slots be used to increase accuracy. The last one use for reload time. The reasoning here is no need to reload as quickly if you are hitting the target more. Plus I noticed that the gunners in this game miss a whole bunch. Upgrading the accuacy they miss just a bunch. I have not really timed it, but since I did the upgrades this way I think they take down dinos much quicker than before. Generate more power than you need and have multiple power stations. THis helps ensure pwoer is always being generated and increases the chances the electric fence does not lose power. That is pretty much it. They will break out sometimes. Sometimes it will be during nice weather. However doing the above greatly reduces the occurances. My last session playing was about 2-3 hours. I noticed 4 attempts at breakingout and only one succeeded and that was the result lossing power for a short time.